Idiomarum School of Languages was established in the centre of Barcelona in 1994. The thousands of students who have learned in our classrooms are a guarantee the quality of our courses. 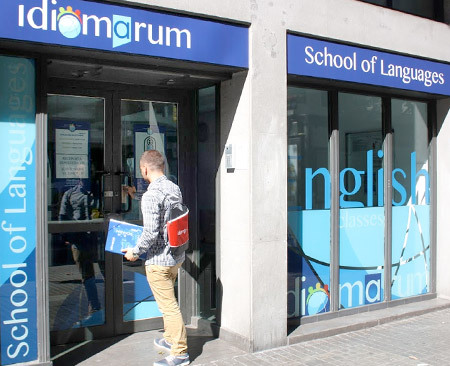 More than 20 years of experience make Idiomarum the language school of reference in the Eixample district of Barcelona. We offer English courses for children, young people and adults, taking great care to maintain the highest quality and personal treatment. The academy has twenty classrooms, all fully equipped with the latest audiovisual support and material, making classes dynamic, enjoyable and effective. Since 2013, Idiomarum has been an accredited centre of the Language School of the University of Barcelona. This gives a guarantee of quality to our courses. We are also an exam centre for the Oxford University’s Oxford Test of English, and a certified preparation centre for Cambridge University Exams.